We’re about more than just monkey business at SIBU Sanctuary. Sometimes other jungle animals need our help, like this tiny red variegated squirrel named Vida. Vida was found orphaned on the side of the road and was picked up by a caring family in Nosara. She was so young her eyes were not even open yet. 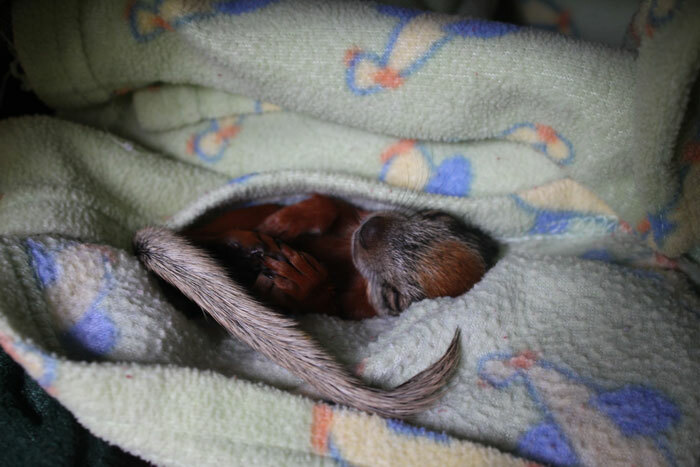 The family bundled her up, and not sure exactly how to care for a baby squirrel, they brought her to us at SIBU. Our first task was to rehydrate Vida, which we did using a homemade version of pedialyte she seemed to love! Eventually, we transitioned her to a special blend of milk formula, and she’s been thriving. Vida requires around-the-clock care and feeding. When she’s not being fed, she spends her time in a soft animal carrier with fleece blankets and a hot water bottle to keep her feeling cozy and safe. Vida recently opened her eyes for the first time, and we’re pleased with how well she’s doing. Our goal will be to care for her until she is old enough to be released in the sanctuary to live on her own as a free squirrel. The current success of Vida’s survival and continued growth is attributable to Vicki’s assistant Director, Reagan Grant. Her unwavering commitment to this helpless baby is a lesson we all should be reminded of. With dedication and care, each and every one of us can make a difference – one day, one soul at a time. Thank you so very much Reagan!